Also known as country sausage, breakfast sausage is usually made from fresh ground pork. Served in patties or in links, the sausage is often lightly seasoned. It was traditionally a way to make use of "off cuts" or scraps of meat left over from butchering. 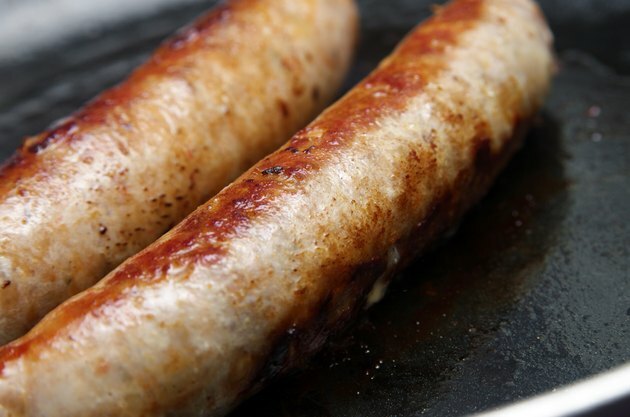 To keep your breakfast sausage healthy, choose low-fat, low-sodium sausages and vary your cooking method. Traditional breakfast sausage is made from ground pork, which is known to be high in saturated fat. A single patty has 88 calories per serving, 5 grams of protein and 7.4 grams of total fat. While the majority of the fat is unsaturated, a single serving still has more than 2 grams of saturated fat and 23 milligrams of cholesterol. The recommendation from the American Heart Association is between 11 to 13 grams of saturated fat per day for those who are on a 2,000-calorie-per-day diet. The recommended upper limit of cholesterol is 300 milligrams per day. While a single patty has a relatively small percentage of the recommended intake of saturated fat and cholesterol, it still provides a high percentage relative to its small serving size. It's only 4 percent of the daily calorie limit, but takes up 18 percent of the daily allowed saturated fat. While untraditional, a breakfast sausage made from turkey is healthier than a pork-based one, as it contains fewer calories and fat per serving. A single serving of turkey sausage, weighing about the same as a single pork patty, has only 56 calories per serving. It also contains more protein and less fat. A serving has 6.8 grams protein and just under 3 grams of total fat. Like with pork sausage, the majority of the fat is unsaturated fat, but there is significantly less saturated fat per serving, with just under 0.7 grams per serving. A single serving also has 26 milligrams of cholesterol. A diet high in cholesterol and saturated fat increases your chances of developing heart disease and stroke. Making your own breakfast sausage is simple, especially as ground meat is easy to find in grocery stores. Choose either ground pork or ground turkey, and mix it with traditional spices -- fennel, garlic, pepper and oregano -- to make an affordable and healthier breakfast sausage. A single serving of ground pork, weighing approximately the same as a serving of turkey or pork breakfast sausage, has fewer calories, fat and cholesterol, and more protein per serving than pork breakfast sausage. Ground turkey, especially low-fat ground turkey, is even lower in calories, fat and cholesterol, while still being a good source of protein. To further keep your breakfast sausage healthy, change your cooking method to reduce the amount of added fat. Instead of pan-frying the sausage, bake your patties to reduce the amount of added fat. When baking, put your patties on a rack so that the excess fat drips off of the patties. Breakfast sausage, like other processed meats, is often high in sodium, with pork sausage containing 220 milligrams per serving and turkey sausage with 190 milligrams per serving. When making your own patties, you can limit the amount of added salt, instead boosting the flavor with more spices and a longer marinating time. The American Heart Association recommends most Americans limit sodium intake to 1,500 milligrams, especially if you have high blood pressure or are at risk for heart disease. Do I Have to Cook Pancetta Before I Eat It?